Does anyone have this cable? I attended a panel discussion on “The Status of Black Women in Utah” several months ago with the sincere intention of listening and learning. I knew I had missed something important when I got home. Everyone on the panel and in the room seemed to be calling out to be heard, including myself. I wondered if we are all call out, who is left to listen? The quandary left me agitated. Who indeed? 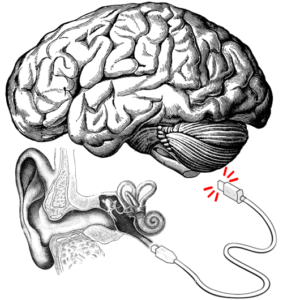 Our ears are sensitive instruments, designed to discriminate subtle differences in sound. Listening requires differentiating the shades and tones in the sounds to make meaning. At times, when I am hearing, the sounds seem to bypass listening en route to my brain. My mind proceeds straight into to synthesis, which is a nice way of saying assimilation, appropriation, and preparation. My brain maps the words and the experiences the speaker describes to my own. I filter and even reorganize the words, seeking commonalities and pattern matches. My intentions seem good. I am looking for common ground. Eager to be relatable, I am planning for a future conversation wherein my story—so like the speaker’s story—will assure them I have heard them and understood. But I deceive myself. While I hear in this way, my mind occupies itself drawing analogies and normalizing the sounds. It integrates the speaker’s signals into my previous experiences, transforming the speaker into someone like me. In the process, I override the nuances that make their experiences different from my own. I mistake that I am listening when I do this. I am not. I am sublimating differences. I am not listening to their story but reinforcing my own. I then cannot wait to tell the speaker my story, which I believe is so like their story. I do this to demonstrate how well I have understood, and worse than that, how relatable and therefore likable my similarity makes me. In doing this, I usurp their experience reframe their story as my own, communicating only that I heard something and that I certainly did not listen. By some miracle, I did not give voice to my “hearing” that day, even though the internal alchemy I described above had indeed occurred. I thanked the organizers for the event and went home with my thoughts like a person who knows they have left something behind but can’t say what. I knew it had something to do with everyone wanting to be heard, but no one listening. Oh. Myself included. I may have failed to listen, but I learned something valuable about my habits nonetheless. When I map another person’s experiences to my own, I annihilate their story and fail to learn anything new from them. I cannot build bridges by recasting folks into roles that fit my movie. I understand now that I’ve missed a step in comprehension. It is only by recognizing, appreciating, and exploring the differences that I will ever be able to listen.